It’s that time of year, when holiday entertaining is upon us. If you are anything like me, each year you vow to make this holiday season easier than the last. Whether you are entertaining a large family or a small intimate group, a holiday gathering is to be enjoyed by the hostess and guests. 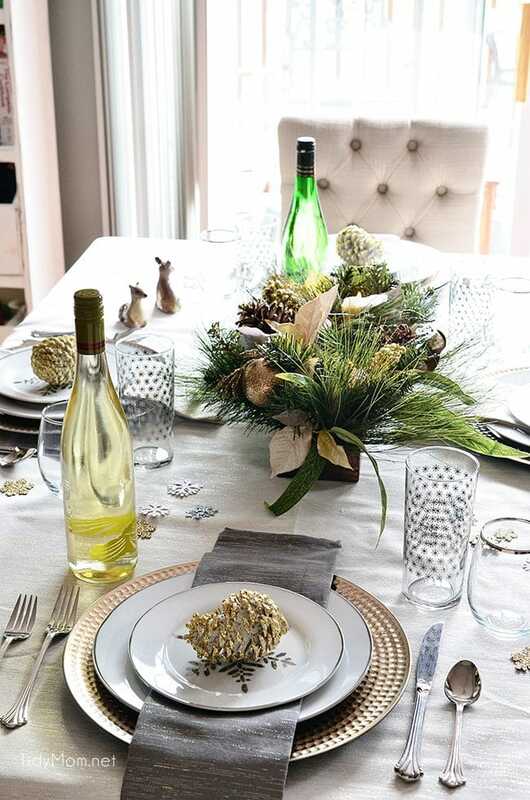 We all know to run the vacuum and dust (or if you’re lucky, hire someone to clean), but as the self-proclaimed tidy mom that I am, I’ve got a few tips for holiday entertaining that I’ve picked up over the years to get your home party ready. 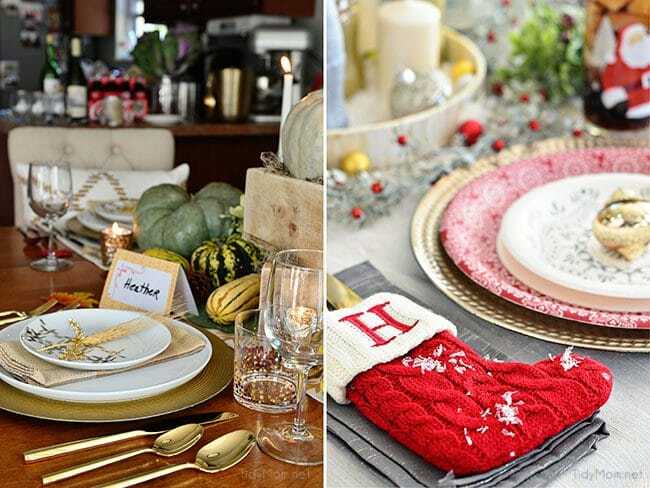 Tips for holiday entertaining to help you prepare your home, and your meal so you can relax and enjoy your guests. Go through traditional family recipes, cookbooks, your favorite food blogs, and Pinterest. Find some recipes that can be made ahead of time. It’s amazing what food you can actually make prior to the day-of! 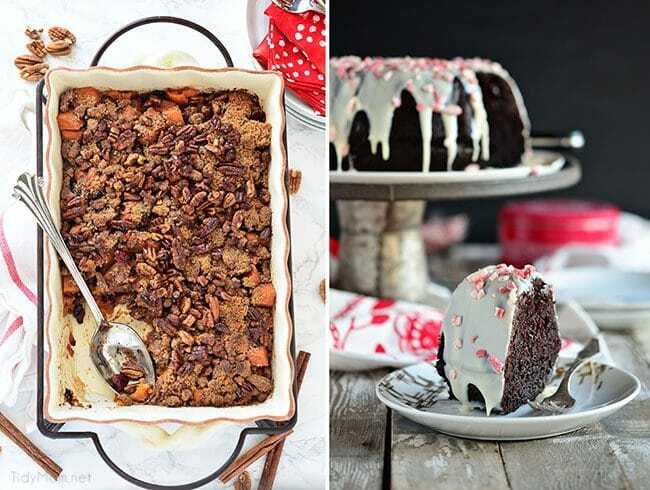 Many desserts, like my Chocolate Peppermint Brownie Cake, are just as good when made a few days before eating and so are foods like cranberry sauce and sweet potato casserole. So plan ahead and start food preparations early! If you decide on a potluck, make a list of what type of food (appetizers, desserts, side dish, salad, etc.) you’d like guests to bring and let them know once they accept the invitation. 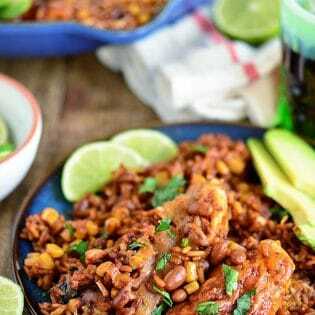 Have extra food on hand if you are having a pot luck. For example, I always have a super quick appetizer on hand and I’ll usually make a few extra desserts or snacks just in case. If we don’t need them, I can send them home with guests, or put them in the freezer for later. But, if we run low on food, I can quickly grab a tray of brownies, quick bread, cheese and crackers, or even something store-bought! Clean Your Table. Start by removing everything from your dining room table and giving it a good scrub down or polish. Grab Your Supplies. 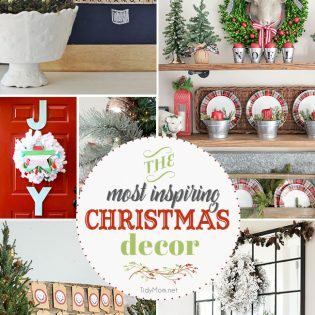 Holiday gatherings are the perfect time to bring out the festive party ware. Plan table linens, dinnerware, glassware, seats, and serving ware. If you need to shine silver flatware, do it now. Don’t be afraid to use plastic and paper. Lay It Out. After you have all your supplies, lay them out on your table to get an idea of what they look like together. Grab a couple chargers and place them in front of each chair. Go with plain chargers and then get decorative with the plates, glasses and napkins, you can even print place cards. This is my biggest tip, are you ready?…….Only clean what the guests see. That’s right, you don’t need to clean every nook and cranny of your home before your guests arrive. No one will notice if the baseboards behind the couch are dusty or if the linen closet upstairs is a mess. If you have time, you can certainly do a deep clean, but no one is going to notice, or care about the places in your home they won’t be in. Everyone likes to hang out in the kitchen with the food, that’s where you want to put most of your energy. Wipe down the counters, cabinets and appliances. 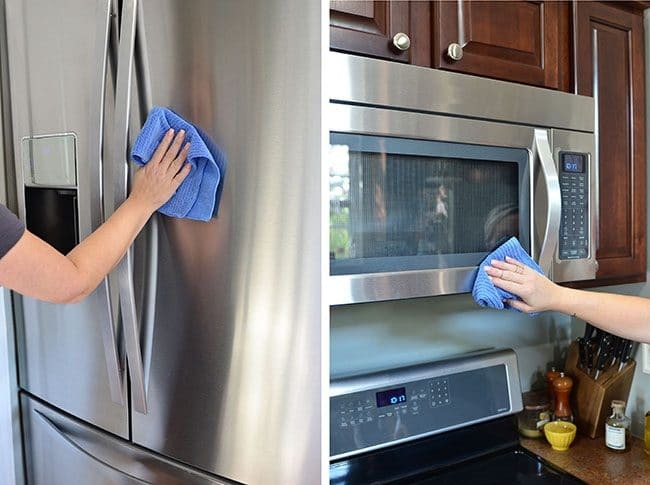 I like to use a 3-in-1 Microfiber Cloth with stainless steel cleaner to clean my stainless steel appliances. Don’t forget to shine the sink! My secret weapon, a Scotch-Brite® Extreme Shine Pad makes my stainless steel sink shine! Clean out all the old food in the refrigerator and freezer to make room for all the extra holiday food and wine. 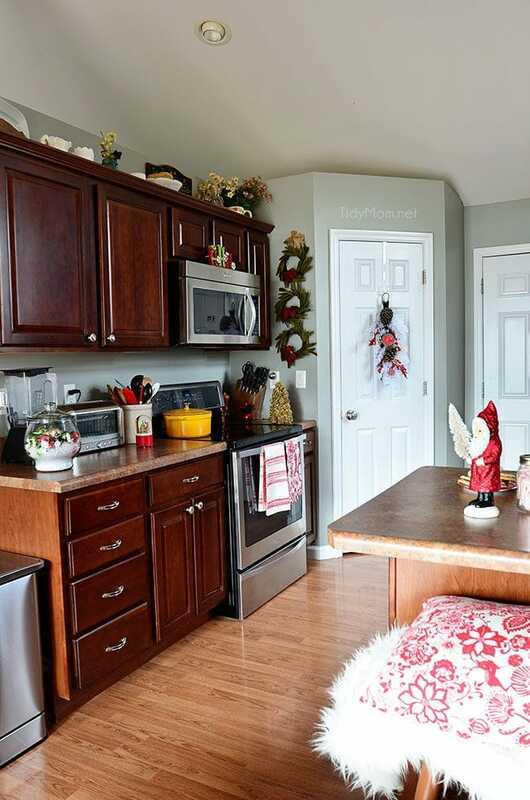 Also focus on the front entryway (inside and out), any bathrooms guests will be using (see how I keep the bathroom clean in 5 minutes every day), and the main room you plan on gathering with your guests (the family room, living room or basement). Clean in the morning. Open those curtains,shades and blinds! You won’t be as likely to miss a dirt, dust and grime if you clean in natural daylight. Tip: The Scotch-Brite 50% Stickier Lint Roller is great for dusting lamp shades. Stash away clutter. The day’s mail, kids’ artwork and photos on the fridge, a stack of books to return to the library, kitchen counter clutter–tuck them all away and just leave out what looks pretty. Clean the air. Open a window (even if it’s cold) and let in some fresh air. Light a candle or try simmering orange peels, a few cinnamon sticks and whole cloves on the stove for a few hours (add water as needed, usually every 30 minutes or so). If you are a type A (like me) you might like to take the honor of making and planning the entire feast, or holiday gathering. Things will run much smoother and be less stressful if you have some help. People often WANT to help! Just ask. If your uncle is good at cutting the turkey, ask him if he can arrive a little early to cut and plate it. Older kids and teens can help bring out chairs, and take guests jackets as they arrive. Remember, you want to enjoy the day as well. Spills and messes are almost inevitable during the course of a party. Keep those spills and mishaps from bringing down your merry hosting mood by having an emergency clean up kit easily accessible. I like to keep a basket or caddy handy, in the laundry room or garage, filled with a Scotch-Brite 3-in-1 Microfiber Cloth, a Scotch-Brite Non Scratch Scrubbing Dish Cloth, a Scotch-Brite50% Stickier Lint Roller (great for cleaning up broken glass), surface cleaners, carpet/spot cleaner and a small dust pan and brush. When a mess, spill or other situation arises, I’m not frantically looking for my cleaning supplies! Make sure you sit down, eat and enjoy your guests. 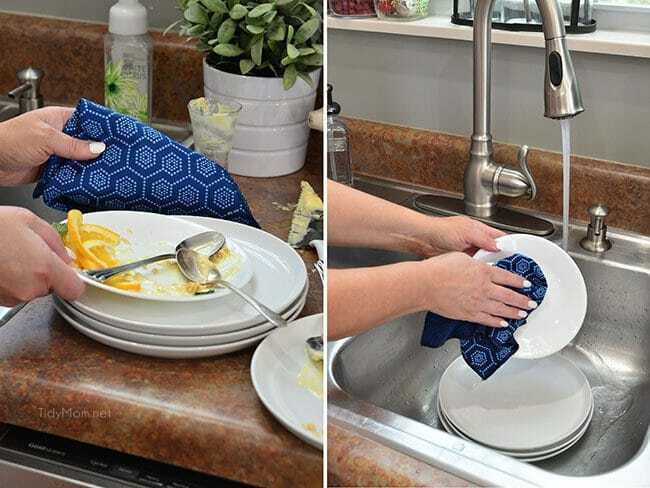 Don’t worry about picking up trash and dirty dishes or if the kitchen is a disaster during the party. Remember, be flexible in your plans, life happens and unforeseen holiday challenges may arise. With a little planning though, your guests will enjoy the food an your company. LIKE THESE ENTERTAINING TIPS? PIN IT! Disclosure: I have a working relationship with Scotch-Brite™ Brand, but as always, all views, opinions……and my love of a clean home are all my own. Thank you for supporting the brands that support TidyMom. I love all of your tips! Easier is the way to go. Thanks for sharing. Terrific tips! 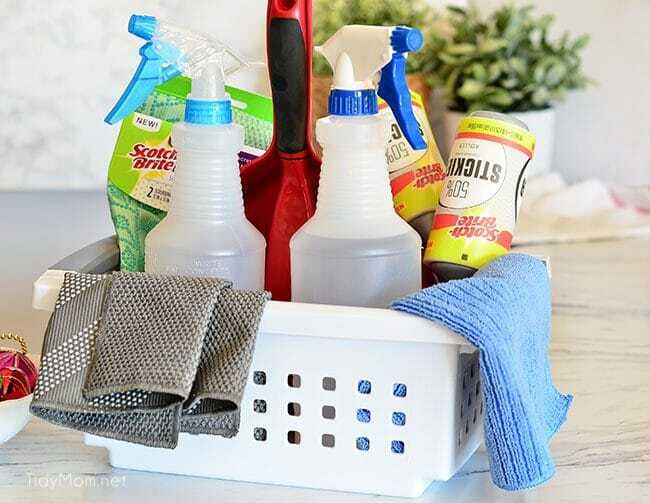 And I love the idea of creating a portable cleaning tote!!! I especially like #6. 🙂 But all great tips. Merry Christmas, Cheryl!